Just as the previous working party commenced, the late March working party started with Dave 1 locating the profile cut plates for the crashbeams, which had been ordered a week before. Loaded onto a trolley, he moved them to the C2 Shed for safe keeping. Over the next few days Dave 2, Chris, Matt and James all took turns with a flap wheel, removing the mill scale from the plates. It's a tedious task, but an essential one. There is more to do, but the process is now well under way. With most of the smaller diameter coupling rod bearing cover plates now turned, Andrew turned his attention to the larger diameter cover plates. 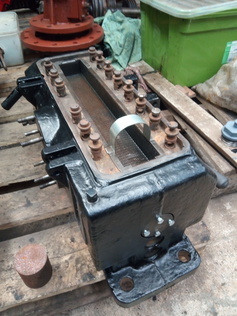 Only the rear cover plates for the driving crank bearings can currently be machined, as we have not yet finalised the position of the connecting rods which influence the thickness of the front cover plates. Using hie experience from the previous working party, Andrew made good progress, and had completed turning the first of the larger diameter cover plates in a short time. With most of the smaller diameter coupling rod bearing cover plates turned, Dave 1 undertook to complete the machining of them. This involved milling recesses for the bolt heads in the front cover plates, and spotting the hole centres for the bolts. Again, with experience gained from the previous working party, the task did not take long. At this point Dave 2 took over, and drilled the bolt holes. The front cover plates have clearance holes, but the rear cover plates require the holes to be tapped, so Dave 2 carried out this operation too. We now have a good collection of finished coupling rod bearing cover plates, although there are still more to be done. 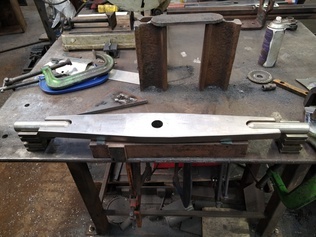 To complete the turning of the larger diameter coupling rod bearing cover plates, and to allow them to be milled and drilled, another set of mandrels was required. Dave 1 sketched up the designs, rather simpler than the mandrels for the smaller diameter cover plates based on lessons learned. He and Chris located some steel bar, manoeuvred it to the band saw, and cut off a suitable length. Chris then commenced turning the new mandrels, a task which Dave 1 completed the following day. Dave 1 then used the first of the new mandrels to turn a bevel on the edge of the cover plate which Andrew had turned, and used the second to spot the bolt holes. Dave 2 then drilled and tapped the holes. That's the first of the larger diameter coupling rod bearing cover plates finished. James applied wax to the finished cover plates to protect them. We were conscious that Andrew's time at this working party was limited, as he was heading off to South Africa to play with some narrow gauge steam locomotives there. We therefore focussed on getting components ready for welding before he departed. 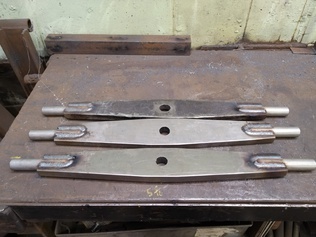 Chris took the two new profile cut plates for the tender brake stretchers, and milled slots in the ends of them to take the spigots which Colin had prepared some months ago. These new stretchers were needed to replace two of the originals which we had found to be made from an unmachinable grade of steel. The third stretcher was reusable, and Erle had milled the slots in it previously. With the slots all machined, Dave 1 and Andrew set up a jig to hold the spigots in line while they were welded into place. Andrew carried out the welding to his now usual high standard. One of the draincock weighshaft bearing brackets had had an ugly flame-cut modification made to it, leaving it very thin in one place. After Dave 1 had cleaned the bracket, Andrew built up the thin section with weld, taking care not to put too much heat into the component to try and avoid causing any distortion. Matt then used an angle grinder and flap wheel to grind back the welded areas, to neaten up the remaining flame-cut edges, and to give the bracket an overall clean. Several of the draincock operating linkage levers had badly worn holes in them. They are rather nice little castings, so we want to repair and reuse them. So, once again, after Dave 1 had cleaned the levers, Andrew filled the worn holes with weld. After cooling overnight, Matt ground the surfaces flush, and reprofiled one lever which had previously been weld-repaired in China. Dave 1 then remarked the hole centres, and Dave 2 drilled them. Andrew and Dave 1 checked the geometry of the draincock operating linkages against the Polish drawings, and concluded that our locomotive is to drawing in this respect. That meant that the draincock dropper links should be to drawing, and so Dave 2 cut to length the tubes sourced a month previously. Andrew then welded the end clevises onto the rods. Matt used a flap wheel to remove any weld spatter, and cleaned the rods. With quite a number of components finished and cleaned, Matt hung them up on the rack at the end of the shed and applied primer. The following day, thanks to the nice warm weather, the primer was dry and James was able to apply a coat of paint. 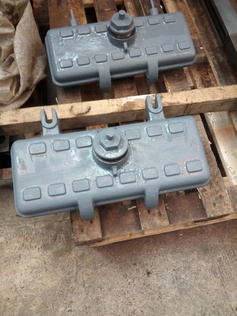 The draincock pivot castings and weighshaft collars which had been primed at the previous working party also received paint. At a previous working party, Dave 1 had turned up a replacement for one of the draincock pivot shafts. At last he got the opportunity to turn the second pivot shaft. These short shafts now require keyways to complete them. While on the subject of draincocks, Dave 2 has been busy with the lapping of the draincocks. One may require a bit more attention due to some deep scoring, but the others are all completed. While the above activities were going on, Erle was busy quietly working away on the overhaul of the lubricators. They are Chinese copies of American Nathan DV4 lubricators, and so he has obtained the relevant American manuals which are proving very helpful. The primary filter trays are shown in the manual to have loops of metal, either to act as handles or to act as springs to hold the filter in place when the lid is closed. The filter trays we have show where the loops once were, but the loops were missing. Erle has therefore started making up replacements. A feature of the American built lubricators, which Erle discovered from photographs on-line, was the inclusion of cast plates which clearly label the type of oil to be used. Since we have two lubricators on our C2, one for bearing oil and one for cylinder oil, it is important to put the correct type of oil in each lubricator. Ed has created mock-ups of the cast plates using his 3D printer, so Erle attached them to show how they might look. The lettering is yet to be finalised, but those present thought they looked very good. The lower filters are made of a tube of very fine brass gauze, mounted around a central flat steel strip, and held in shape with brass rings soldered in place. Erle has discovered that the brass rings are very similar to standard olives used in plumbing joints, thus giving us a cheap and easy source of these components. He has started to experiment with soldering samples of brass gauze to the olives, using a wooden dowel as a former. It isn't as easy as it might at first appear, as too much heat burns the wood, while insufficient heat results in a poor soldered joint. More experimentation is required to perfect the process. Erle found a set of plug gauges in the measuring equipment cupboard in the works, and checked the diameter of the filter housings in the bottom of each of our three lubricators. They are all slightly different, but after discussion we have arrived at a diameter for the filter which will enable it to be common to all three lubricators. The lower filters from our lubricators were badly damaged, probably through becoming completely chocked with dirt, but it has been possible for Erle to determine that the filter gauze has a pitch of approximately 60 threads per inch. He has obtained a sample of brass gauze of the same pitch but with a lesser open area, and carried out an experiment to determine how quickly cylinder would would pass through it. Although not fully immersed in oil as it would be in the lubricator, we felt that the flow rate was too low. Erle's challenge is now to try and find a source of brass gauze with a similar pitch but greater open area. Alternatively, we may have to use a courser pitch gauze if the cost of the finer gauze is prohibitive. To give himself a break from working at almost microscopic level, Erle gave the lids of two of the lubricators a thorough clean, using the degreaser followed by a wire wheel. We need some smaller wire wheels to get inside the filler caps, but most surfaces are now greatly improved, and the outsides have been primed. 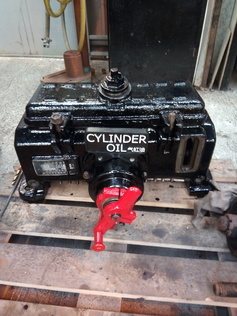 To understand how the oil pumps within each lubricator work, Erle has dismantled one of them. It looks to be in good condition, but we won't know what pressure it can generate until it is reassembled into the lubricator. Erle has taken the remaining pumps home to clean up as a homework project. Finally, our master fixer of things, Dave 2, gave some attention to the lock on the main door to the C2 Shed. The lock has been very stiff and awkward to use for some time. Dave 2 diagnosed that it was caused by a lack of lubrication to some of the moving parts. After applying oil, the lock works perfectly again.